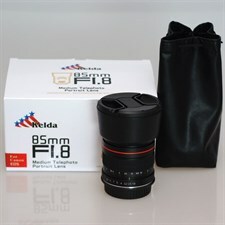 Creates outstanding sharp, defined images with high contrast at the maximum f/1.8 aperture. Superior peripheral brightness by using hybrid aspherical glass, correcting chromatic aberration. Super multi-layered coating reduces flare and ghosting. Highly refractive and dispersed optical elements (6 elements, 6 groups). Maintains a compact size with an inner focus design. Suit for Canon EOS Camera.